With the summer transfer window now open, there is plenty of gossip doing the rounds in the newspapers so we’ll keep you up-to-date with the latest transfer rumours. Today, Chelsea remain confident of signing Wayne Rooney. Chelsea remain confident they will head into the new season with Wayne Rooney as their centre-forward and have made signing the Manchester United striker a top priority, according to the Independent. Rooney’s future at Old Trafford has been in doubt ever since former boss Sir Alex Ferguson revealed the striker asked to leave the club towards the end of last season after being left out of a number of key games, including the decisive Champions League quarter final second leg against Real Madrid. New boss David Moyes insisted at his first press conference last week that the 27-year-old would be staying at United this summer, but the Independent claim this has not deterred Chelsea from thinking they can pull off a major coup and the signing of Rooney is now Jose Mourinho’s No.1 priority this summer. Rooney has spent the last nine years at Old Trafford since joining from Everton but with just two years left to run on his current deal, the report suggests that Chelsea are confident he won’t sign an extension and feel they can therefore persuade United to cash in now rather than see his value drop considerably as he edges closer to the end of his contract. Should the planned swoop come off, the newspaper claims Mourinho will then look to offload either Fernando Torres or Demba Ba to make room for the England ace, but Romelu Lukaku is expected to stay in west London this season and will be part of the squad that flies out to Bangkok on Thursday for the clubs pre-season tour. There is no doubt if Chelsea can sign Wayne Rooney this summer it would be a major coup but whether United will be willing to sell a key player to a title rival remains to be seen. 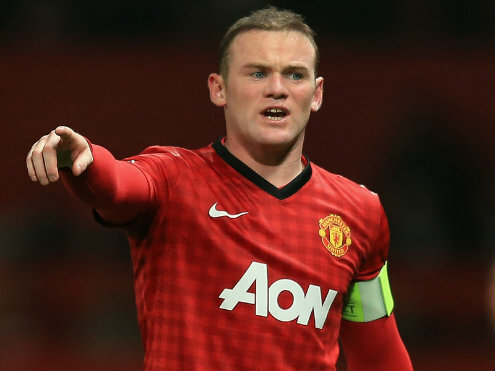 There is sure to be interest from abroad as well so the decision may come down to Rooney’s desire to remain in England. If he wants it enough and Chelsea are prepared to pay, we could well see him lining-up alongside Terry, Lampard, Cole, etc, next season. Do you think Rooney will end up at Chelsea? Share your views below. UTD are afriad of rooney going to chelsea. Except us no other team in EPL will always b ambitious as Rooney is, prob Chelsea would be his only chance if he wants to secure a place in World cup squad. Going abroad at this time doesn’t make sense! Football is all about game and business!. Any player can end up anywhere no matter the rivalry. Why is Man U afraid of selling Rooney to Chelsea? Didn’t they buy RVP from Arsenal also their close rival?. Years back we saw Luis Figo switch from Barca to Real over night,what happened- absolutely nothing!. Most recently, Goetze moved from BVB to Munich and football is still going on. So,I see no big deal in Rooney switching to Chelsea, afterall there’s nothing he would win in Chelsea that he hasn’t won with Man U except Europa league which is more or less a below par performance at champions league to earn that. Football is all about game and business!. Any player can end up anywhere no matter the rivalry. Why is Man U afraid of selling Rooney to Chelsea? Didn’t they buy RVP from Arsenal also their close rival?. Years back we saw Luis Figo switch from Barca to Real Madrid over night,what happened- absolutely nothing!. Most recently, Goetze moved from BVB to Munich and football is still going on. So,I see no big deal in Rooney switching to Chelsea, afterall there’s nothing he would win in Chelsea that he hasn’t won with Man U except Europa league which is more or less a below par performance at champions league to earn that. Rooney will not be our medicine, if possible let him come but if we can find Suarez, we can even leave about Rooney. Rooney ll fit into Chelsea’s squad perfectly since Mou has vow 2 bring him back 2 top most form nd equally make him a happy one. So sadden that he has no future in Man U anymore even a blind man can testify 2 that when Fergi landed Van Persie. He ws left out of d squad during their championship encounter with Madrid so humiliating. where ws Moyes whn Rooney needed them most now that he wants 2 leave is d tym Moyes is bend on keeping him. in d first place y did u allow him leaved Everton? My advise 2 Moyes is 2 allow this young man 2 breath some fresh air. He wants 2 be happy wit Mou! @hygman, dnt forget dt Rooney is yet to win the FA cup and so coming to chelsea is more than sure that his going to win it. I think rooney is go for chelsea because chelsea have wat he want,they have the midfilders that will give the ball to score,with the like of mata,hazard,oscar,lampard,schurrel,van gen.moses i think rooney is going to be a world class player under the specal one,man u shuold let him go to chelsea.